It doesn’t normally take me this long to get through urban fantasy. The book just got away from me. Literally. I lost it, along with the rest of the series, to relatives visiting over Christmas break and didn’t get around to getting another copy until last week. So I’m just making sure to say the dates read have no bearings on how much I like this book. 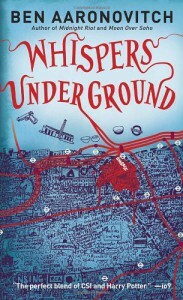 This is another great installment by Ben Aaronovitch and the series definitely improves with each book. All the praises I had for the previous two books also apply here. Not that it should matter, but I feel as though I’m being repetitive when I say how much I like this series and Aaronovitch’s writing. The premise is an American international student is found dead in a subway tunnel. The cause of death is murder, of course, and quite possibly murder by magic, which is why Peter Grant is called to the scene. Now that Leslie May is made apprentice, she also joins in on the investigative work. This case introduces Peter and Leslie to a whole new world of magic, very different from what’s he’s encountered up to now, and the trail takes him under ground into the tunnels, sewers, and more rivers of London. This new world of magic is literally a whole world, a different way of living, under ground. Once again, Aaronovitch has found interesting ways to incorporate London’s history into London’s present time and then work both into the murder mystery and magic of the week. Like the previous two books, this story is another journey into the heart of London, this time literally, and what I really like about that is you learn new things with each chapter. I spent a good part of a weekend looking up London’s messed up sewer systems, and I didn’t mind at all. Another thing I like about these mysteries is that they’re smart and smartly plotted. They’re usually one step ahead of my calculations and that’s just how I like murder mysteries. In the old days every police station used to have a collator–an officer whose job it was to maintain boxes of card files full of information of local criminals, old cases, gossip and anything else that might allow the blue-uniformed champions of justice to kick down the right door. Or at least a door in the right neighbourhood. The metal was painfully cold under my hands but it took me less than five seconds to get my foot on the top bar, swing myself over and jump down. My shoes skidded on the cobbles but I managed to recover without falling over. Given that all three of us were Londoners, we paused a moment to carry out the ritual of the “valuation of the property.” I guessed that, given the area, it was at least a million and change. “Million and a half easy,” said Carey. Molly gave me a long stare and then inclined her head at me, exactly the way Ziggy the dog had, before gliding off towards the stairs. Possibly to put fresh linen on the guest bed or possibly to sharpen her meat cleavers–it’s hard to tell with Molly. “Stop,” I yelled. “Police.” I hoped they would, because I was getting knackered. Our fugitive tried to pick up their pace, but my height gave me the advantage. Between duckings I glimpsed a patch of grey. I opened my mouth to yell “Daylight” and then really wished I hadn’t when I got a mouthful of diluted sewage. It was another intersection. I saw an alcove with a ladder and lunged–only to be swept past, with my fingers centimeters from the metal. My foot hit something underwater hard enough to pitch me over and the world’s first-ever Anglo-American Olympic sewer luge team broke up. The scenes in the sewer had me laughing for a good hour. There plenty more hilarious moments like these, but they edge into spoilers territory so I will refrain from listing all of my favorites. References to familiar sewer mythology (trolls), under ground urban legends (alligators, cannibals), and cult favorites (raves) scattered throughout the narration are hilarious and cleverly embedded into the narration. I often find myself laughing when something catches me off-guard. What I like about Peter Grant as a narrator is his unabashed sense of duty (“Oi! Stop! Police!”) and his easily distracted mind when on duty (Doctor Who, Harry Potter, LotR, snow, rain, shiny things, etc.). Without magic, there’s a chance he wouldn’t be able to survive on the job for long. Or he’d be relegated to a desk job, as the first book suggested. I rather like the additions to Peter, Nightingale, and Dr. Walid’s Scooby gang: the matter-of-fact Sergeant Kumar of the tunnels, the sarcastic and lecherous Zach of mysterious origins, and young and curious Abigail the hopeful apprentice. Not much love for Leslie May, I’m afraid, muddled explanations below*. I have high hopes for each of these new characters, with the exception of Leslie, and I hope that we’ll get to see Agent Reynolds again in the near future. This might be a stretch though because she’s from across the pond, and it would be quite a stretch to feature her in future mysteries. But she’s in on it (magic) now, so it’d be a waste if this is where the road ends for her. Peter is special, more special than previously suggested. He’s deeply connected to the city somehow and we’ve only just scratched the surface of these connections. He’s able to tap into the heart of London not once but twice now. Well, two and a half times, if you count that one telling moment with Simone near the end of the last book. It’s unclear whether this is a skill all practitioners of magic have or just Peter. * I’m just not feeling the characterization of Leslie May. And Peter’s “more than friends” attraction to her? Not feeling that either. Beverly Brook, on the other hand, I definitely felt the chemistry between Peter and her, but that’s another thing entirely. Back to Leslie. What I do feel is that Leslie is a capable cop and a pretty face, which should relegate her to secondary character status like the rest of the characters in the book who aren’t Peter. This is probably just my knee-jerk response due to Leslie not being featured much in the series up until now, or maybe I just don’t like the characterization because connection between Leslie and Peter seems forced. At best, there’s some attraction there (albeit one-sided and unrequited); at most, it’s just a friendship and strong bond over magic. Aaronovitch could do a lot better than interjecting her into the story by giving her magical inclinations, and by “he could do better,” I mean not forcing her presence into the story. Both Molly and Toby have more presence than Leslie, and Molly doesn’t even talk and Toby is a dog, though an enigmatic one. Maybe bring back Beverly Brook? In case it hadn’t been mentioned enough by other reviewers, this series should be a TV series. I hope something is in the works because this series has the makings of a rollicking procedural. Ben Aaronovitch should be involved behind the scenes somehow, and this guy (Alfie Enoch) should definitely play Peter Grant. Seriously. He’s got the looks, attitude, and presence to own the character. Harry Potter fans might know him as Dean Thomas from the movies and Sherlock fans might remember him from that one episode.